A recent state analysis of the costs of the death penalty in Indiana found the average cost to a county for a trial and direct appeal in a capital case was over ten times more than a life-without-parole case. The average death case cost $449,887, while the average cost of a life-without-parole case was only $42,658. The study, prepared by the Legislative Services Agency for the General Assembly, found that even while factoring the longer incarceration period for those sentenced to life without parole, the cost of the death penalty still outweighed the cost of life without parole. The study also noted that Indiana was following the national trend of declining use of the death penalty. 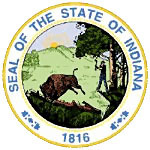 Indiana prosecutors did not file a single new death penalty case for more than a year from August 2006 through December 2007, according to the public defender council. Between 1990 and 2000, prosecutors requested the death penalty in 153 cases from the 4,617 murders and homicides reported in the state. From those 153 cases where the death penalty was sought, 48 went to trial, 25 resulted in death sentences, and 4 actually resulted in an execution. Clark County Prosecutor Steven Stewart stated that, while he agrees with the death penalty, it does cost more than life in prison without parole. (S. Brown, "The death penalty: Worth the cost?" NWI Times, July 4, 2010). See Costs and Studies.